Cash conversion cycle measures the lag between when companies have to pay their suppliers and when they get paid by their customers. At department store chain Macy’s, it’s 71 days. At the legendarily efficient Wal-Mart, 12 days. At Costco, with its limited inventory and super-fast turnover, it’s just four days. 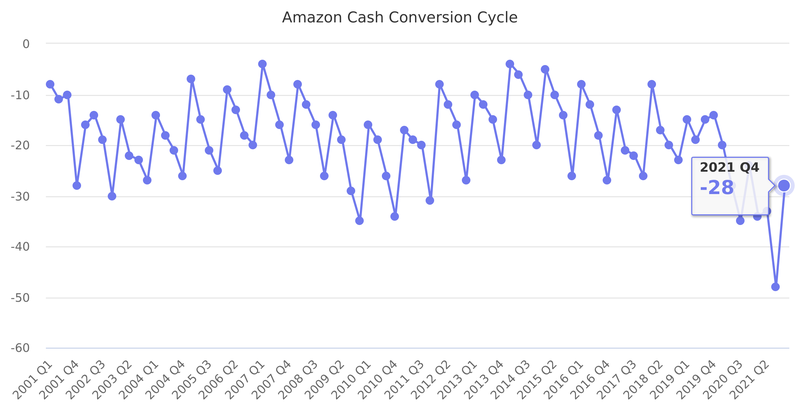 At Amazon, the cash conversion cycle was negative 24 days in 2014. That is, on average the company took in cash from customers 24 days before it paid it out to suppliers. Cash conversion cycle is calculed as Days Inventory Outstanding + Days Sales Outstanding - Days Payable Outstanding. Last reported quarter 2018 Q3 it was -18.21, down by -19% year-over-year from -22.58.